I finally got a top made during the Spring Top Sewalong! And this is a good one! 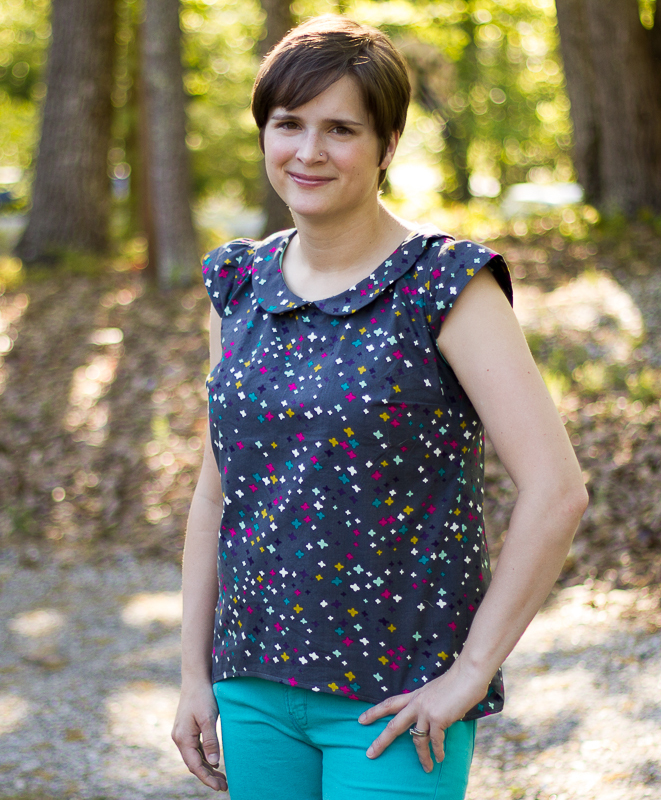 I got to pattern test a new top pattern for Sew Caroline this week called the Sugar Top Pop. Isn’t that a fun name? I have been hoarding this Koi fabric for a while just waiting for the perfect top and the peter pan collar won me over! I really like this new top. It has quite a few fun features: a subtle hi-lo hem, a flutter or cap sleeve option, and the peter pan collar. 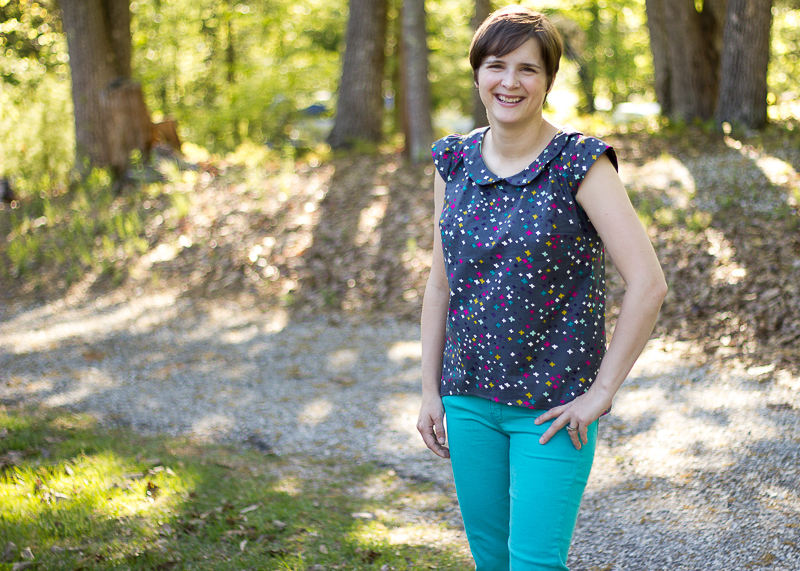 While I am having fun collecting apparel-weight fabrics, I liked that this top looks good made in a quilting cotton. It is also pretty awesome that the fabric happens to match my turquoise pants. I made the size L based on my bust measurements but then graded down to a medium at the bottom to fit my hip measurements. I used the cap sleeve option but added a little bit of a gather for a pretty effect and to make it easier on myself to set the sleeve in. I love how the sleeve and neckline are finished with bias tape- making such a clean finish! I wore this top out to church the same evening I finished making it, and I got so many compliments on it. It really was quite fun. And I may or may not have worn it again today so I’m thinking I should probably make myself another one! It’s a great top for summer because it’s a breezy style and you don’t have to wear a tank under it. 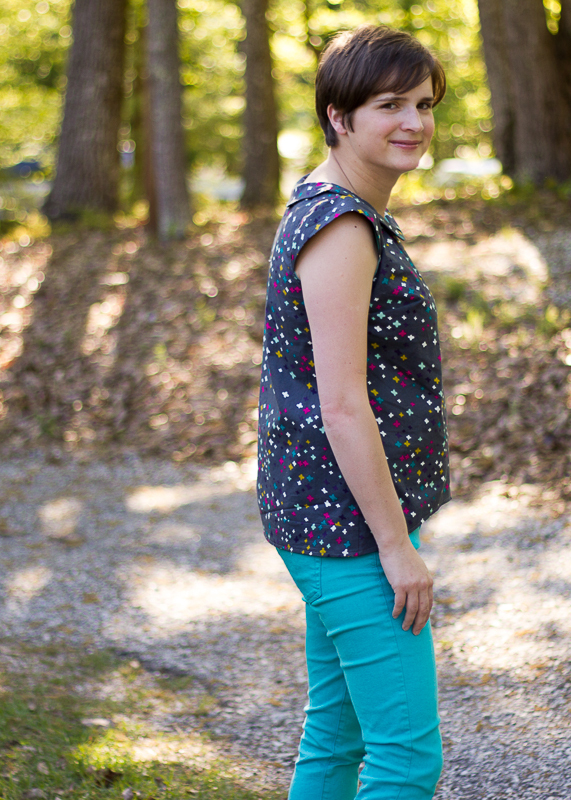 I have it on good authority that this pattern should be releasing next week sometime, so you will have time to get it and make yourself one before spring top sewalong is over! It is definitely one that I would recommend you add to your repertoire. Caroline does a great job with her pattern! I’m already plotting out which fabric I want for my next one (or two 🙂 ). 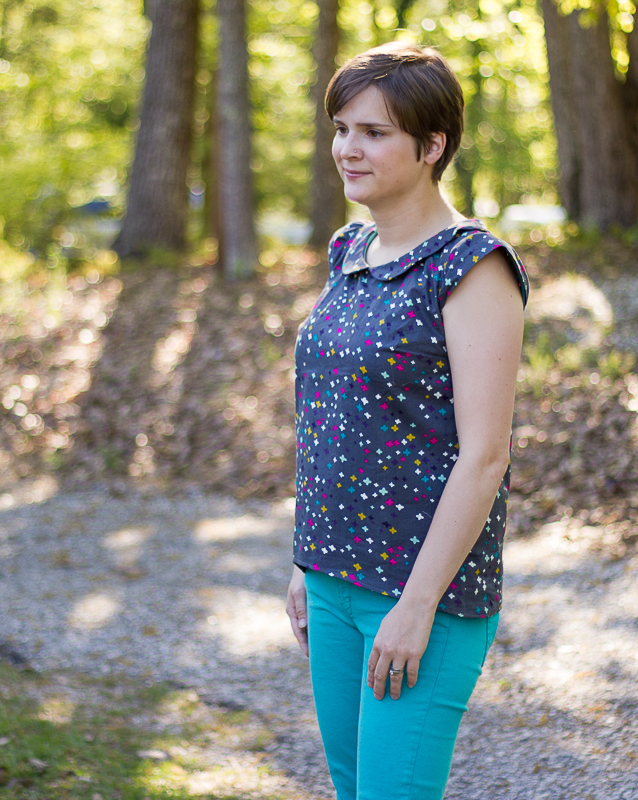 This entry was posted in Selfish Sewing and tagged sew caroline patterns, spring top sewalong, sugar pop top by oliver's fancy. Bookmark the permalink. Thanks! I was going to suggest it on your IG post. It’s a really fun pattern. You should def try it. I just kinda got lucky I guess. Caroline sent out an ig request for testers and I applied and was selected from her applicants. With my other pattern testing I’ve emailed and asked if someone needed help when I knew they were about to release a pattern. It is a good amount of work but also fun!